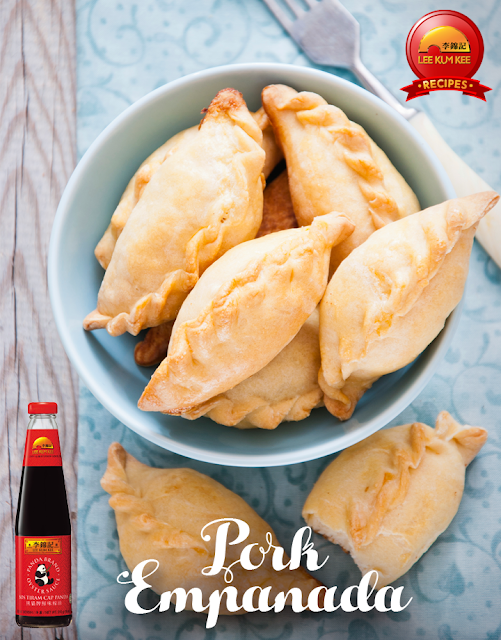 Empanadas are great as appetizers and snacks on the go! The Filipino empanada usually contains ground beef, pork or chicken, potatoes, chopped onions and raisins wrapped in a sweet dough. Make something that’s sure to be a merienda hit! 1. In a skillet, heat oil over medium heat. Add onion and garlic and sauté for 2 minutes or until onion has browned and softened. 2. Add ground pork and sauté for 2-3 minutes or until meat is no longer pink. 3. Stir in Lee Kum Kee Premium Soy Sauce, carrot, potato and frozen green peas. Cover and cook for 5 minutes or until vegetables are cooked. 4. Add Panda Brand Oyster Sauce and raisins; mix thoroughly. Season with salt and pepper to taste. Set aside and cool completely. 5. To make the dough, combine flour, sugar, baking powder and salt in a medium bowl. Add the butter cubes. Using a fork, break up the butter into the flour mixture until it is fully incorporated. Add the water and egg; mix until soft dough is formed. 6. Preheat oven to 400 degrees F. Line baking sheet with parchment paper. 7. Take heaping tbspfuls of dough and form into balls. On a floured surface and using a rolling pin, flatten the dough balls into desired thickness. 8. Place about a tbsp of the filling in the center of the dough. Top with a slice of hard boiled egg. Wet the edge of one side of dough with water and then fold over to form a half moon shape. 9. Seal the edge by folding and pressing them on top of each other. Continue with the rest of the dough and filling. 10. Place the empanadas on the prepared pan. Generously brush top and sides of empanadas with egg wash (whisk 1 egg with 1 tbsp cold water) and bake for about 20-25 minutes or until lightly browned.